A diverse team of law students from universities in Kenya, Angola and Ivory Coast won the 22cnd African Human Rights Moot Court finals on Saturday in Cape Town. In second position was a team comprising students from South Africa’s Stellenbosch University, Libre de Kinshasa in the Democratic Republic of Congo (DRC) and Eduardo Mondlane in Mozambique. The teams were representing the respondent and applicant respectively in a hypothetical case brought before the African Court on Human and People’s Rights. The final hearings took place to a packed house at the Civic Centre in Cape Town on Saturday, the culmination of a five-day event hosted by the University of the Western Cape (UWC) and University of Pretoria, which saw the participation of scores of law student from 55 universities from 25 countries in Africa. The moot case pitted the State of Khalaharia against non-profit organisation Children of Africa Now (CAN!). The case revolved around asylum-seekers Salif, 10, his mother Alima,33, and grandfather Sadig, 61, who fled their war-torn homeland of Natalia and illegally crossed into neighbouring Khalaharia where they were arrested, detained and their rights allegedly violated. While held up in the country, CAN! launched an unsuccessful legal case that the rights of the family, particularly those of the child Salif, were violated by the state. Such alleged violations included Salif, who is blind, being separated from his family and placed in a place of safety in order for him to attend school. However, CAN! Argued that He was placed at a local school, but the state allegedly forced to wear a school uniform not in accordance with the clothing required by his religion, and failed to provide him with Braille textbooks or otherwise aid him in his disability. The non-profit organisation also claimed that Salif’s was neither given a prayer mat nor allowed to pray five times a day as required by his Islamic religion. It also challenged the detention of Alima and Sadig at the immigration detention centre saying in was a violation of their freedom of movement. Having failed to get redress in the local courts CAN! turned to the African Union’s committee of experts on the rights and welfare of the child, prompting the body to investigate the issue. Law student Alma Diamand from Stellenbosch University led the charges for the applicant while her colleague Nyeri Mwathi from Moi University in Kenya represented the state. 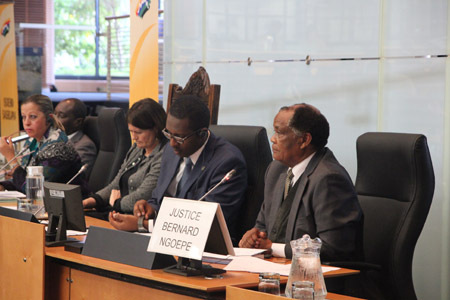 Judges in the matter included retired South African Constitutional Court Justice Kate O’ Regan, Chairperson of the African committee of experts on the rights and welfare of the child in the AU, Benyam Mezmur, and Maya Sahle-Fadel, a member of AU’s African commission on human and people’s rights. During a heated and at times hilarious hearing of the matter, the legal team representing the state denied that Salif’s rights were violated. For instance, it said the state did not have the resources to provide blind students in the country with braille material and if they provided only to Salif, the state would be violating other children’s right to equality. The team said that if Salif was allowed to the wear want he wanted, that would violate public order, as that could mean that some people would be allowed to walk around in their “birthday suits”. Commenting the moot hearings, Sahle- Fadel said the case, although hypothetical, mirrored some of the human rights cases experienced in Africa. In some of the awards given to participants, Stellenbosch University was named the best Anglophone team to in the preliminary rounds, while the universities of Kenya and Gambia were awarded second and third position respectively. Kudakwashe Chitanga from the University of Zambia was named best individual oralist in the Anglophone category, while Sra Geogina Deodato was the best oralist in the Lusophone catergory. Mohammed Fofana from the University of Ivory Coastd was recognised as the best Francophone oralist.